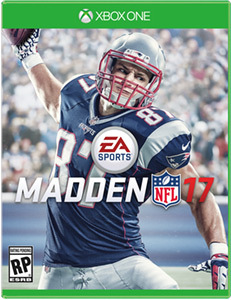 New England Patriots Tight End Rob Gronkowski will join the Madden NFL cover family as the featured cover athlete forMadden NFL 17, hitting shelves on August 23rd for Xbox and PlayStation consoles. Electronic Arts Inc. officially unveiled the Madden NFL 17 cover art, featuring New England Patriots Tight End Rob Gronkowski. EA and ESPN jointly revealed the cover live during the 6pm ET/3pm PT edition of SportsCenter, alongside a video debuting this year’s game. In Madden NFL 17, players on Xbox One and PlayStation®4 can take their team all the way with new gameplay features that elevate the ground game, arming teams for success on both sides of the ball. Gronkowski is one of the most decorated tight ends in the NFL, holding the season record for most touchdowns by a tight end in a season, as well as a four-time Pro Bowler and a Super Bowl Champion. He’s widely regarded as one of the most physically dominant players in the league, and was the highest-rated tight end in Madden NFL 16. EA also released a Madden NFL 17 video today showcasing Gronkowski and the first of several new features for next-gen consoles in this year’s game. Fans can check out the Madden NFL 17 website to learn more about improvements to the ground game, including a new path assist feature, new defensive AI and expansion of ball carrier special moves, which give players new creative controls on the ground, all of which are featured on the Xbox One and PlayStation®4 versions of the game. EA Access* members can try Madden NFL 17 before it’s released for a limited time as part of a Play First Trial, only on Xbox One. Madden NFL 17 will be available for Xbox One, Xbox 360®, PlayStation®4 and PlayStation®3 on August 23. To learn more about Madden NFL 17, visit http://www.easports.com/madden-nfl. For more info on this year’s game, fans can check out the Madden NFL 17 website. Rochester, New York is now the most hyped hometown in America thanks to Pepsi and stud wide receiver Sammy Watkins, a lifelong Bills fan. 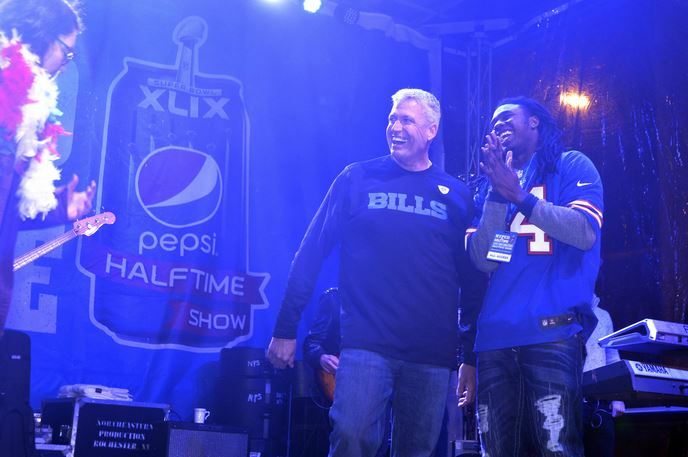 This past Sunday, over 7,500 fans celebrated Rochester’s win in the Pepsi contest with their own ultimate Super Bowl halftime experience headlined by popular singing/songwriting duo Nico & Vinz, and appearances by new head coach Rex Ryan and Watkins. Watkins was the NFL Rookie of the Week three times during the 2014 season and was the NFL Rookie of the Month for October. He also set single-season franchise rookie records with 65 receptions and 982 receiving yards, while scoring six touchdowns. Talk about the work you did with Pepsi. I worked with Pepsi on the “Hyped for Halftime” contest, which was a contest to find the best fans in the NFL. Rochester, NY did a great job as fans and I’m happy to say we won. They did it! They’ve been leading us for 30 to 40 years, helping us on and off the field, so this is a great treat for them. One word to describe Bills fans is “crazy.” When we’re hitting at all points on offense and defense, the stadium gets crazy. Sometimes, we have to quiet them down so we can get the play call in. Pepsi was looking for the best fans and this proves we’ve got the best fans. And, Rochester got their own Pepsi Halftime Show, just like the Super Bowl XLIX halftime show with Katy Perry. What’s your favorite play from your rookie season? Winning the game against the Vikings when I scored on the goalline with one second left. It was a great play call. Coach Moore (former 10-year veteran wide receiver Rob Moore) put me in the position to make the play. He basically said, “This game is going to come down to the wide receivers. Get ready because it may be you.” He called the play, and I made a great play at the end of the game. Who is the best defender you’ve faced? Darelle Revis, the guy who I think is the best corner in the league. The Pepsi Super Bowl Halftime Show is the most-watched musical event of the year. Click here for more details. 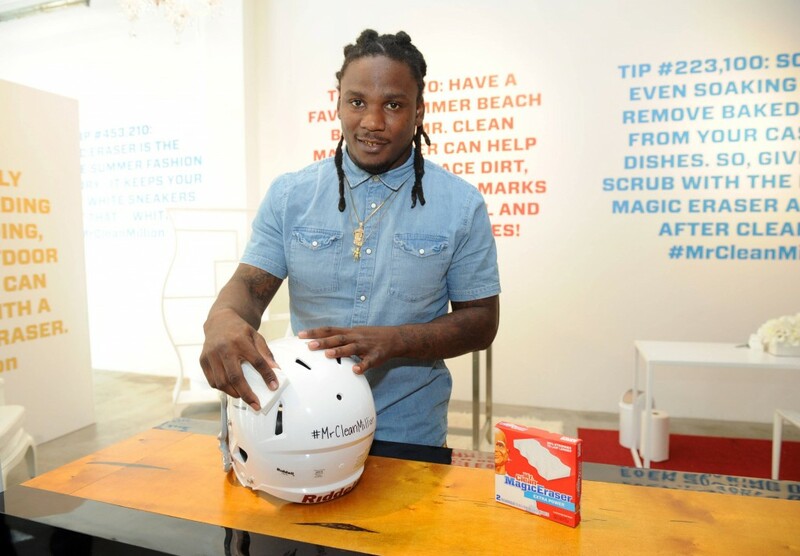 Who knows more about staying clean than New York Jets running back Chris Johnson? One of the fastest players in NFL history, Johnson knows all about bursting through holes untouched and unsullied by opposing defenders. We spoke to him about his partnership with Mr. Clean’s Magic Eraser, how it feels to run a 4.24 40-yard dash and his monster 2009 season. CJ2K! How is Mr. Clean doing these days? I made a mistake the other day. I bought these really nice white Polo shoes – low cut, crisp, the kind you wear without socks. I was looking good. That night, I had an unfortunate incident with a mud puddle on the way home. Guess who was there for me when I needed him the next day? You’ve got six TD runs of over 80 yards in your career. The next closest players only have three. How do you account for that? “It isn’t just one thing. It has to do with everything: vision, speed, once you get out in the open not getting caught, being able to make people miss. On top of that, you’ve got to have your offensive line and the receivers blocking for you downfield. There is a lot to be aware of. What’s your favorite play: a toss sweep, a trap or what? One Mr. Clean Magic Eraser can help you clean about a million tough jobs around the house. Visit www.mrclean.com for more information. There’s a war going on that you may not even know about. We hear a lot about world events like missing Malaysian Airlines Flight 370, Syria and the Middle East. But one thing we don’t hear about is the overspraying epidemic that exists for 75% of guys. 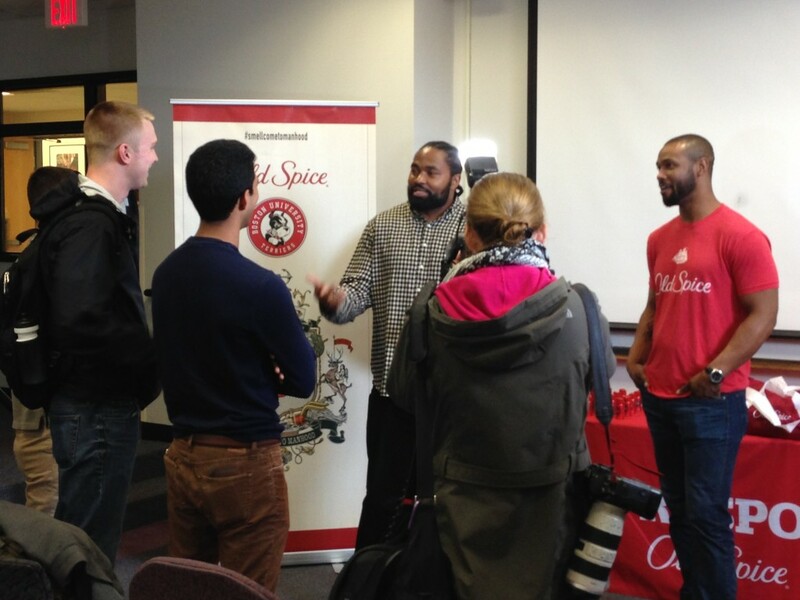 Patriots All-Pro linebacker Jerod Mayo and Old Spice have teamed up to teach men how to scent responsibly and stop this epidemic the way Mayo stopped Ravens tight end Dennis Pitta in the 2013 AFC Championship. “I’m actually on my way now to educate young guys at Boston University to teach them how to scent responsibly,” said Mayo, concern evident in his voice. One reason the problem has reached epidemic levels is ignorance; 68% of guys admit that no one had ever showed them how to apply body spray properly. The first step is acceptance — realizing that you have an overspraying problem and then taking the necessary steps to move forward. Mayo, Captain of the Patriots defense, is here to call out your defensive spray audible. 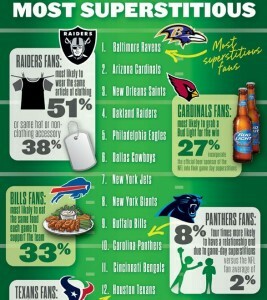 Bud Light – the official beer of the NFL – recently conducted a survey to find the most superstitious fans in the NFL. More than 9,500 interviews were fielded among the 32 NFL team fan bases, including approximately 300 fan interviews per team. More than 50 questions were asked and, out of that, an “NFL Fan Superstition Index” formed. The index calculates the superstition level of each NFL fan base by each fan’s game-day habits – everything from wearing dirty jerseys, chanting and kissing team trinkets to superstition consistency and true belief levels – and aggregates those into a score from 0 to 100. In addition to ranking the teams, the survey also gathered open-ended responses from fans about their individual superstitious activities. – Super Bowl and superstition champions: Baltimore Ravens fans rank as the most superstitious in the NFL. – That’s dedication: Carolina Panthers fans are four times more likely than the average NFL fan to have a relationship end due to their game-day superstitions (8% versus the NFL fan average of 2%). – New Orleans Saints fans are most likely to say a certain saying, phrase, cheer or song for the win (37%). – New York Jets fans are most likely to try to curse or jinx the opposing team (37%). – Some quality me time: Detroit Lions fans are most likely to engage in superstitious activities alone (30%). – Lucky duds: Oakland Raiders fans are most likely to wear the same article of clothing (51%) or same hat or non-clothing accessory (38%) to boost team performance. 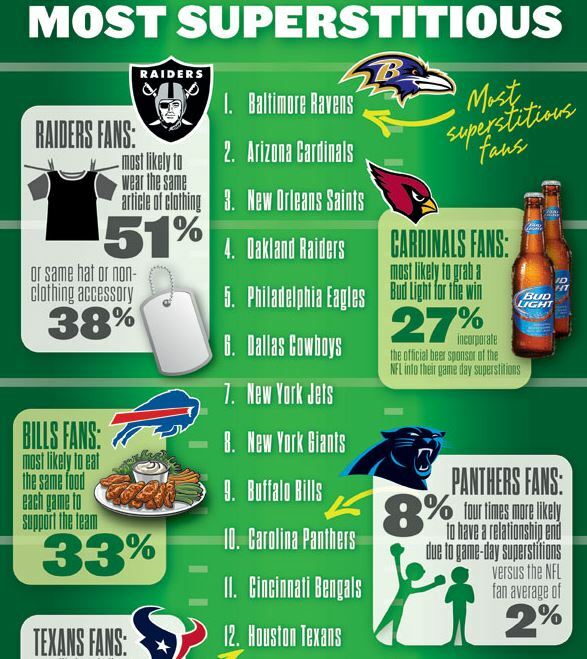 – Arizona Cardinals fans are most likely to grab a Bud Light for the win; 27% incorporate the official beer sponsor of the NFL into their game-day superstitions or rituals. To check out stats relating to YOUR favorite NFL team, follow this link.